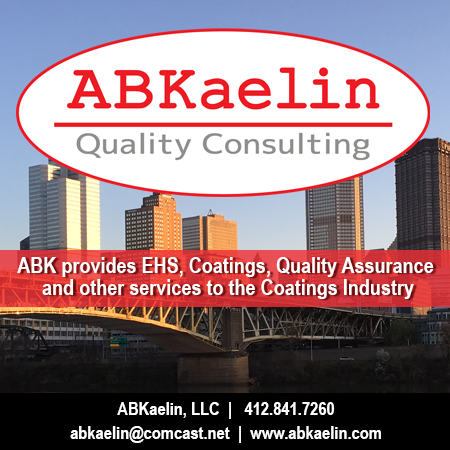 An industrial painting joint venture has been suspended from government contract work following charges of destroying protected nesting sites and hiding employment of undocumented workers on a $70 million Philadelphia bridge project. The Federal Highway Administration announced July 16 the suspension and proposed debarment of Liberty Alpha Joint Venture, comprised of Youngtown, OH-based Liberty Maintenance Inc. and Baltimore, MD-based Alpha Painting & Construction. The suspension is based on an indictment charging company officials with lying to government officials about undocumented workers on the $70 million Girard Point Bridge painting project. The Philadelphia project was funded by the American Recovery and Reinvestment (federal stimulus) act. 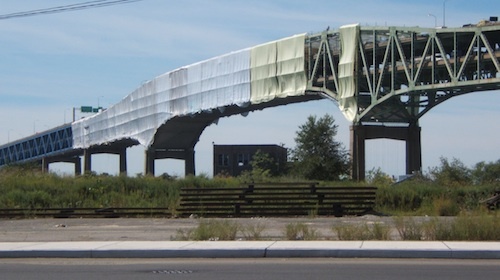 Liberty Alpha Joint Venture has been suspended by the FHWA indefinitely after allegedly destroying protected falcon nesting sites and hiring illegal workers on the Girard Point Bridge project in Philadelphia. The employment of illegal workers was brought to light when investigators started questioning company officials about the disturbance of protected peregrine falcons. The FHWA indefinitely suspended Liberty Maintenance Inc., Liberty Alpha Joint Venture, Alpha Painting & Construction, Nikolaos Frangos, George Capuzello, and Mikhail Zubialevich (aka "Russian MIke") from participating in U.S. government funded projects and contracts, pending debarment proceedings. The suspension resulted from a federal indictment, filed May 13 and unsealed May 21, charging Frangos, Capuzello, and Zubialevich with criminal conspiracy, witness tampering, perjury, false statements, and harboring an alien. According to the indictment by the U.S. Attorney's Office in Philadelphia, Frangos was part owner of Liberty Maintenance and a principal of the joint venture. Capuzello was a foreman for the joint venture and assigned to supervise a painting crew on the Girard Point Bridge project. Zubialevich was an employee of the joint venture assigned to a painting crew under the direct supervision of Capuzello. The indictment alleges that Liberty Alpha JV employees, including an illegal immigrant, violated a Pennsylvania Department of Transportation contract when "they disturbed and ultimately destroyed protected bird species nesting sites." 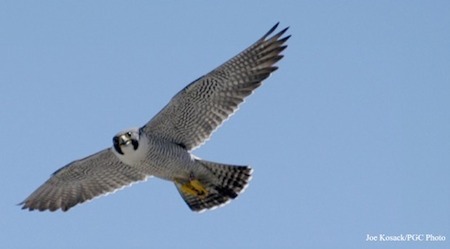 The PennDOT contract safeguarded nesting sites along the Girard Point Bridge, which has been a nesting site for peregrine falcons for many years, according to the indictment. The species is protected by the federal Migratory Bird Treaty Act and the Pennsylvania Endangered Species Act. The contract required the joint venture to hire a qualified "dedicated observer" to monitor the habitat and nesting areas, according to the indictment. The contract specified that Liberty Alpha JV agreed to refrain from working on areas of the falcons' nests during nesting season. However, on June 4, 2011, Capuzello allegedly directed Zubialevich and Walter Morgan, aka Walter Eduardo Morgan Gomez, to perform grinding or sanding in the "restricted zone," which frightened and disturbed the falcons, causing them to abandon their nest. Morgan allegedly gained his employment with the company by using a Social Security number that did not belong to him and falsely claiming U.S. citizenship on an I-9 form, according to an August 2013 indictment. After entering the U.S. illegally, Morgan allegedly used the false information to obtain employment with Liberty Alpha JV on the Girard Point Bridge and another federally funded project: painting and restoration of the 30th Street Train Station in Philadelphia. Frangos allegedly didn't want enforcement authorities to discover that the joint venture had employed illegal aliens, so the defendants allegedly conspired to hide Morgan's identity when confronted by government agents about the falcons. Frangos and Capuzello also allegedly also intimidated another worker into saying that he had been responsible for disturbing the site. If convicted, Frangos faces a maximum sentence of 35 years in prison; Capuzello faces a maximum of 40 years in prison; and Zubialevich faces up to 20 years in prison. Morgan faces a maximum sentence of 10 years imprisonment, a three-year term of supervision following his release, a $500,000 fine, and a $200 special assessment. The indictment is part of a larger investigation looking into allegations of Disadvantaged Business Enterprise (DBE) fraud and corruption on bridge painting projects in the Philadelphia area. The FHWA is investigating the case with the Federal Bureau of Investigation; U.S. Department of Labor OIG; Social Security Administration OIG; Homeland Security Investigations; Environmental Protection Agency, Criminal Investigation Division; Amtrak OIG; and the Internal Revenue Service, Criminal Investigation Division. Ten dollars to a donut, no one gets any time out of this. Any takers??? I’ll bet it will cost them $30,000.00 in fines. I wish the same diligence and penalties would be imposed on the constant strings of employers who willfully disregard safefty resulting in the death of workers.